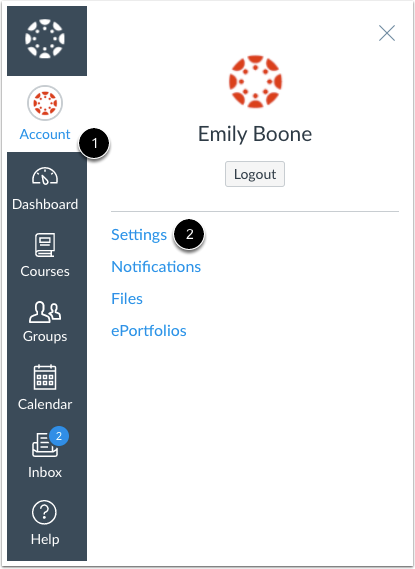 Your default email address is used as your main contact method in Canvas and is added when creating your Canvas account. Email addresses are used to create Canvas notifications; they are not used as a contact method for other Canvas users. 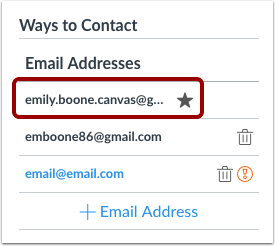 If you add another email address as a contact method, you can change your default email address in Canvas. In the Ways to Contact sidebar, under Email Addresses, you can tell what email address is your default by the star icon next to the email address. 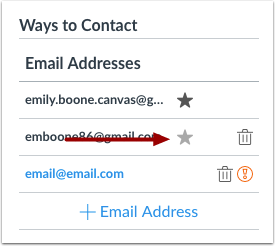 To choose a new default email address, hover over the email address and a faint star icon will appear. Click the star icon. Previous Topic:How do I add an additional email address as a contact method in Canvas as a student? Next Topic:How do I reset my password as a student? Table of Contents > Profile and User Settings > How do I change my default email address in my user account as a student?